I have fond memories of my grandfather patiently snapping the ends off the fresh green beans. As a kid I always enjoyed helping make the fassoulia. These beans, when cooked, should be fairly soft, not firm. They go great with most dishes and are best served with rice. Total Time: 1 hour(s) 20 min. Prepare the green beans by breaking the tips off. Wash in cold water. Saute the onion in the olive oil for about 5 minutes. Add chopped garlic and saute for an additional 2-3 minutes. Dry the green beans and add to the onions and garlic, along with the cumin, garlic powder and broth, letting it cook over low heat. Add water as the beans cook, until they soften. Once the beans have softened, add the tomatoes and tomato paste. Don't stir in the tomato paste (it will stick to beans better). Add the water from the tomato if required. Add salt and pepper to taste and bring to a boil. Simmer for 45 minutes, but the longer you simmer, the better it will taste. Very good flavor. 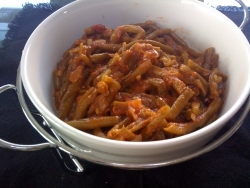 We enjoyed this very much - the green beans are silky smooth and are perfect with white rice. My Nona, and mother would make this all the time. Brings back many memories, and a wonderful side dish. Thanks for the posting.